Online card sorting is a usability tool that helps categorise your webpages by identifying how visitors would expect to find content or functionality. 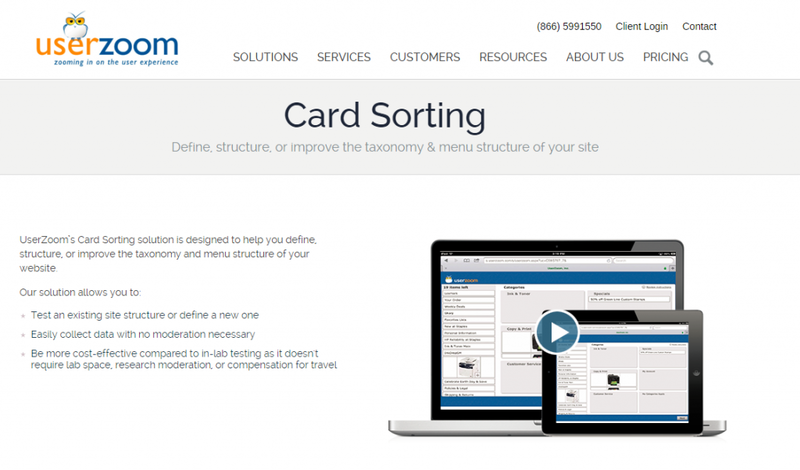 Online card sorting is a quick and simple way of evaluating your information architecture, workflow, menu structure or user navigation journeys. Card sorting tools ask users to organise topics into categories and may involve them naming these groups. Card sorting is sometimes used after a tree testing (or reverse card-sorting) exercise identifies findability problems with current navigation journeys. Tree testing evaluates how easy it is to find an item by getting participants to solely use the website’s navigation (i.e. without any use of internal search or other navigation aids) to complete a set task. Card sorting using online solutions allows you to quickly identify how customers group topics together. How Does Online Card Sorting Work? The card sorting online provider will recruit a sample of people who are roughly representative of your target audience or customer base. Participants are then asked to organise topics into categories that they feel make sense. They may also be asked to label these groups to ensure the words you use are what users would expect. It does not make allowance for users’ tasks. Card sorting is a content-centric process and if used without considering users’ tasks it can lead to an information structure that is not usable when dealing with real tasks. Make sure you evaluate the output from a card sorting exercise by discussing the potential impact on key user tasks. It can be superficial as participants may not fully consider what the content is about or how they would use it to complete a task. Card sorting results may also vary widely between participants or they may be fairly consistent. Ensure you don’t rely on too small a sample of users to reduce the risk of a few participants overly influencing your results. Card sorting online tools should be used to inform your decision making and be viewed alongside other research and usability testing to ensure it is used appropriately. For example you might want to consider tree testing (reverse card sorting) to evaluate the findability of items in your navigation structure to validate your card sorting findings. Like any research technique card sorting tools cannot tell you exactly how users will respond on a live website . For this reason it is wise to consider A/B testing any major navigation changes first if they risk having an impact on key success metrics. Open card sorting involves participants being asked to organise topics into groups that make sense to them and then give a name to each of these groups that best describes its content. This is great for understanding how users’ group content and the terms or labels they apply to each category. Closed card sorting is where users are asked to sort topics using pre-defined categories. This is normally used once you have clearly defined your main navigation or content categories and need to understand how users organise content items into each category. Often organisations use a combination of the two methods to firstly identify content categories and then to validate how well the category labels work in a closed card sort. Below I have summarised 7 of the top online (remote) card sorting tools and 4 software solutions for using off-line. Online card sorting solutions allow for remote user testing so that you can save on the cost of a lab and it allows participants to conduct the test in the safety of their natural browsing environment. Remote user testing can also be incredibly quick as participants can be recruited online and asked to complete the study almost immediately. Here are seven online card sorting tools summarised for you to consider. An additional four offline cards sorting solutions are summarised below the online tools. 1. Optimal Workshop: Discover how real people think your content should be organised and obtain user insights to make informed decisions about information architecture. Priced at start from $109 per month, $149 per survey or $990 for an annual subscription. 2. Provenbyusers: A new online card sorting solution that is in Beta and is currently free for users to try it out. Add or import your cards, add a survey and test your card sort before you launch the exercise. Email your participants a unique URL and you can view results immediately. The UI allows you to analyse data using industry standard tables or download your data to analyse as you wish. 3. SimpleCardSort: Online card sorting with the ability to turn on subgroups to capture multiple levels of card placement. This PRO feature allows users to drag one grouping of cards into another grouping. An additional PRO feature offers participant replay which logs every decision made by users and logs each time they sort a card, create a new group or rename an existing group. Free demo-account allows you to try out the service with a simple card sort. A Basic subscription starts at $49 for 30 days or $99 for the Pro 30 day plan. 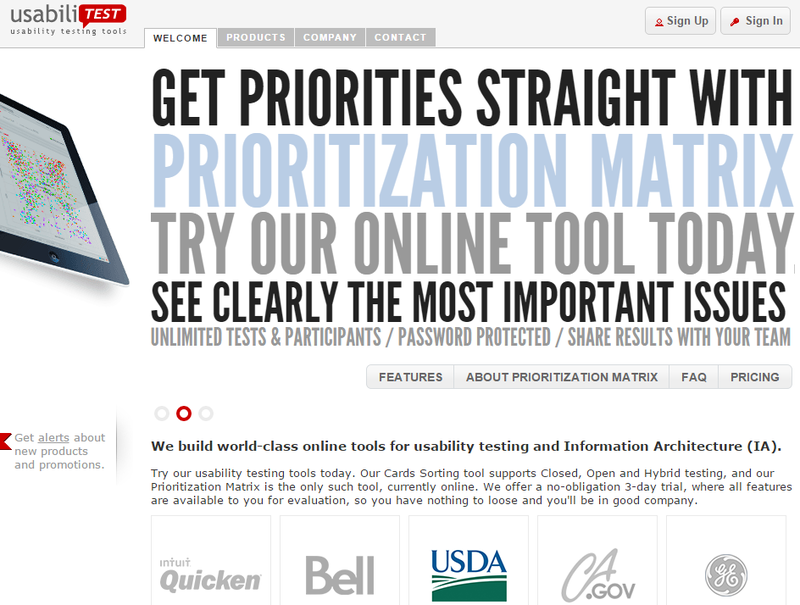 4. usabilitiTEST: Online card sorting tool that supports closed, open and hybrid testing. 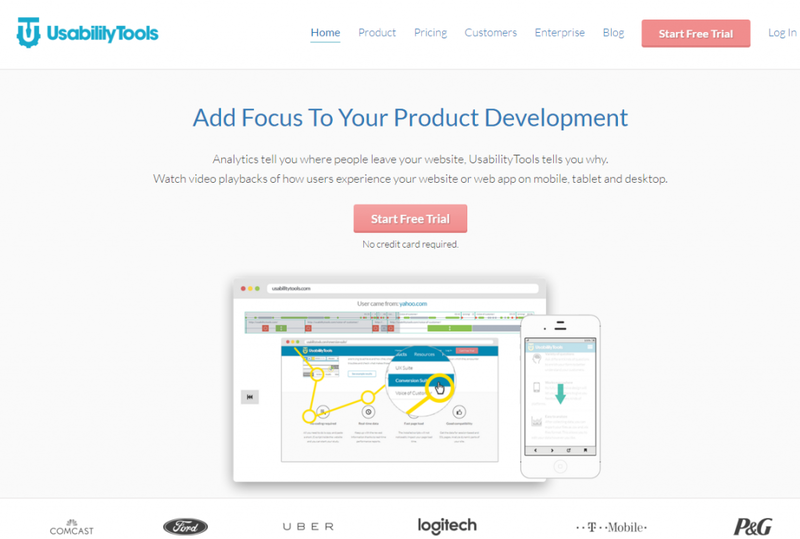 Offers a no-obligation Free 3-day trial with all features available for your evaluation. Provides a Prioritization Matrix tool that helps rank tasks by a frequency and importance criteria. This can help identify which issues are of most importance and give priority to resolve first. 5. Usability Sciences: A full-service supplier of usability research, Usability Sciences has been established for over 25 years and will design, manage and analyse the result of your card sorting research for you. They offer both open and closed card-sorting solutions for you. 6. 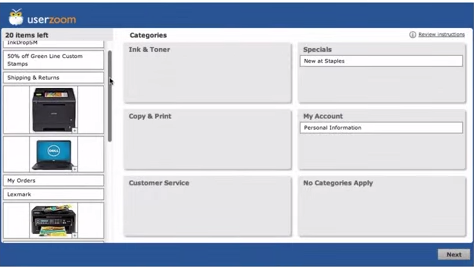 Usability Tools: Card sorting is just one of the tools in their impressive UX suite. Supports open and closed card-sorts, and randomisation of cards and categories. Offers a 14 day Free trial and you can obtain a price quote by submitting your details using a short form. 7. 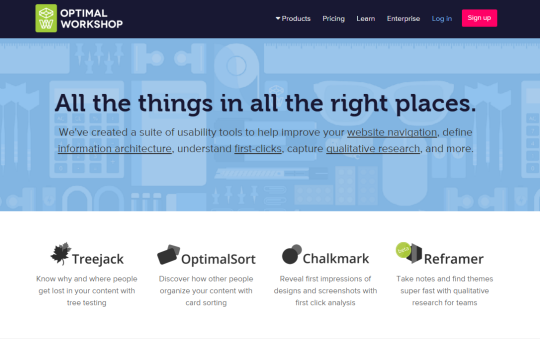 UserZoom: Offers clients a full usability suite, including web-based card sorting. Supports up to 100 items and 12 categories. Supports open and closed card-sorts, randomisation of questions to reduce participant bias, and follows a responsive design so participants can take studies on either their desktop or iPad. Using an iPad makes the process more of an intuitive experience by harnessing the power of touch-screen technology. UserZoom is Ideal if you are a large organisation looking for a comprehensive usability testing programme, including information architecture/UX design, benchmarking and market research. For businesses subscriptions start from $19,000 a year. If you prefer to conduct card sorting offline with users you have recruited locally there are a number of free software solutions available to use. Summarised below are four free card sorting software tools you can use. 8. UXSORT: This is a free open-sourced card sorting software that you can download onto a computer running Windows (Windows 7 is preferred). 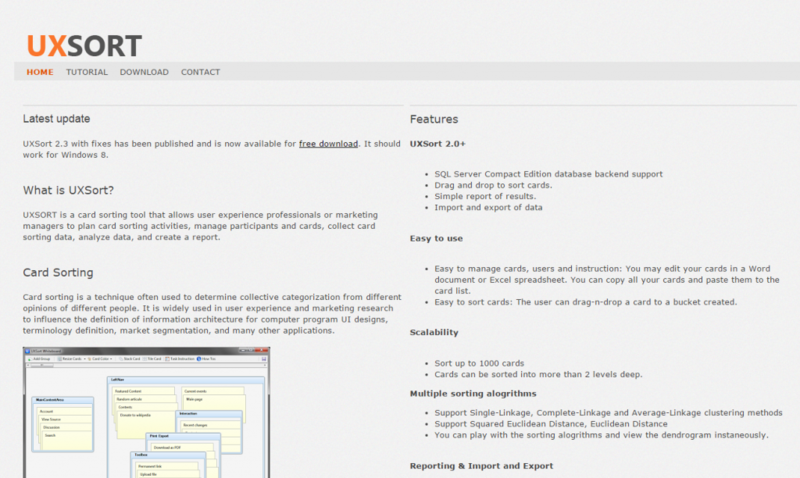 It allows you to import a list of cards using Word or Excel and the software enables you to sort up to 1,000 cards. Users click and drag cards into pre-set categories and you can view results using real-time reporting. Data can be exported and merged, with each participant’s data presented and exported individually. The software does allow you to aggregate results and run a cluster analysis. The reporting uses a dendrogram or family tree to present results. However, the software is not for everyone as it requires basic knowledge of SQL databases because installation includes SQL Compact. However, the site does provide a step-by-step installation guide to help you complete the process. 9. Uzilla Mozdev: This is a free DIY card sorting tool which uses open-source Mozilla based software which is compatible with Windows, Macintosh and Linux. The software allows you to create open sorting and closed sorting projects where participants drag topic options into the category blocks. For closed sorting you can disable the feature that allows respondents to add new labels. The software only runs in Mozella and you will need to download the UzCardSort software library. The analysis is more limited than some of the cloud-based solutions but the developers plan to release new features over time. 10. The Web Category Analysis Tool (WebCat): This is a free open source card sorting software solution that works on Windows or Apache web servers and on Unix systems running Apache. The software creates a Java applet that provides an interactive user experience where participants clicks and drags items from a list to one of several category bins. Labels can be moved back and forth between bins until the participant is happy with the outcome and submits their choices for analysis. The project manager can view collected data using the integrated clustering algorithm and interactive tree. The reporting tool also includes a link to the raw data, subject by category results and a table of any verbatim comments from respondents. 11. 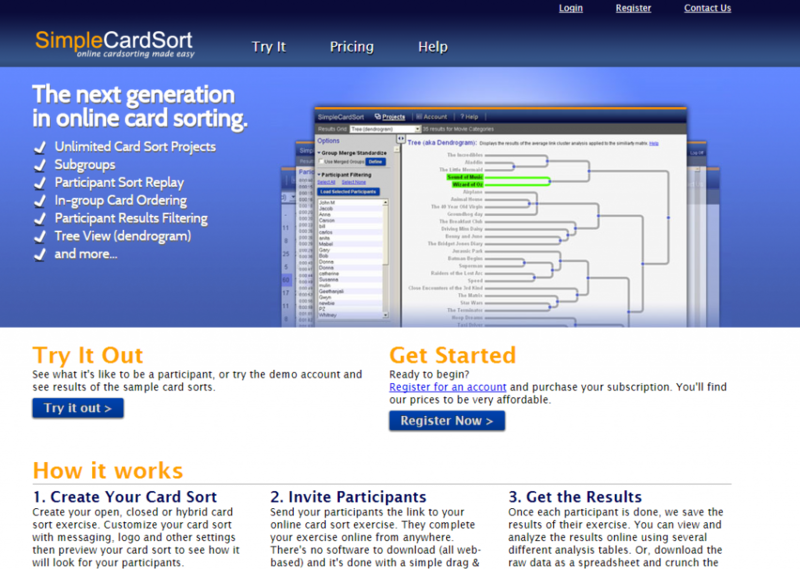 XSort App: This is a free card sorting tools designed for Macintosh. The tool offers both open and closed sorting, plus a combination of the two. The software simulates a table with cards on it so that participants can click and drop cards into the relevant category. It also allows respondents to create sub-categories if needed which can be useful for developing drop down menus. The reporting functionality allows you to view results in real-time and export data if required. The developers plan a web-based version of the software to allow participants to respond to studies without having to be on a Macintosh. 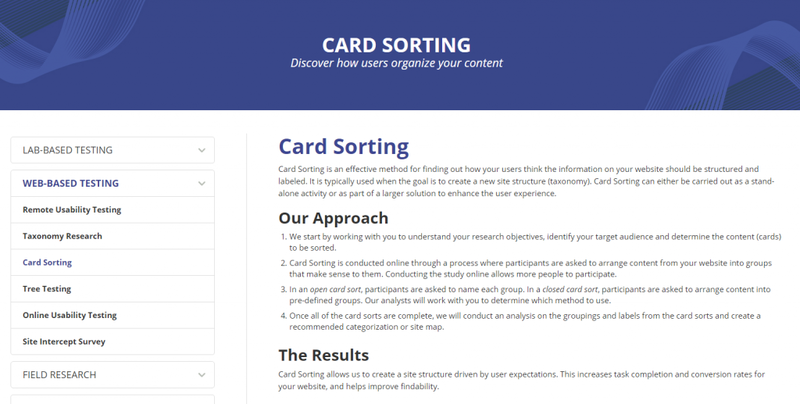 Many of these online card sorting tools offer a free trial or demo so don’t let cost put you off trying out card sorting to improve your information architecture. This is such important element of the user experience don’t leave it all to chance. Get some input from real users. You should also seriously consider using tree testing to validate card sorting results and evaluate the findability of categories or products on your site. Thank you for reading my post. I hope you found this post useful and if you did please share using the social media links on this page. You can view my full Digital Marketing and Optimization Toolbox here. I also have a glossary of over 100 conversion marketing terms.